We offer professional teaching with ski instructors, all teachers own license. Telemark is a technique of turning on skis. It was pioneered by the Norwegian skier Sondre Ouverson Norheim at the end of the nineteenth century in the Norwegian region, Telemark. Currently, telemark has been experiencing a rebirth on the white slopes all over the world. Experience an amazing feeling of free movement on skis with loose heels, the style that our ancestors enjoyed. We only use modern equipment designed especially for this renewed ski style. Leave the training of your children to the professionals. Prevent your children from developing bad habits right from the beginning, and let them enjoy the lessons through games full of fun. The lessons focus primarily on safety and the ability of your children to master the basics of skiing in the shortest time possible.. We are running babyskipark ŠkodaPark. We offer classes at all levels, beginners through advanced, including classes that prepare you to become a ski instructor. Join the course which best fits you. With the arrival of carving skis, the teaching methods have become distinctively different. Our modern training methodology is to help you, our client, to fully enjoy the freedom of movement on skis in the shortest time possible and to develop gradually his/her skiing skills. Our ski instructors acquire the expertise in this modern type of instruction through courses and seminars with top ski instructors from many different countries from all over the world. 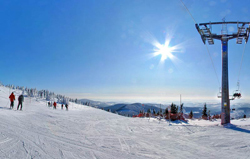 Snowboarding is one of the most dynamically developing branches of winter sports. Our instructors are able to teach you to ride the slopes with just a few snowboarding lessons.